Spectacular house with 4 suites in Portogalo Condominium. 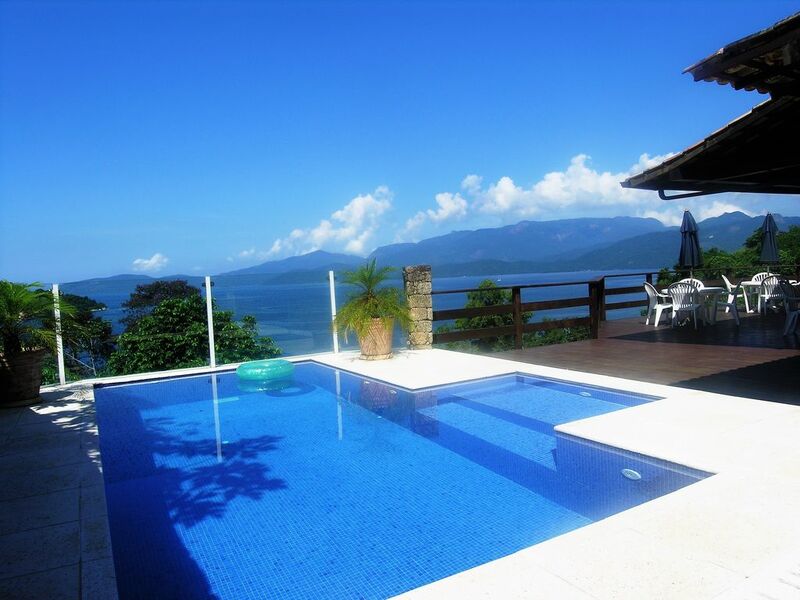 Large deck with stunning views of the ocean and the Big Island (Ilha Grande). The house has on the first floor an internal area with large living room, set of sofas, wine cellar, 8-seater dining table, toilet, TV room (50 "), cable TV, game room with snooker, table tennis and TV (42 "), kitchen with 5 burner stove and spacious oven, 2 refrigerators and 1 freezer. On the second floor there are a circulation room and 4 suites, all with sea view, Queen bed and 2 single beds (bunk bed). In the outdoor area you will find the swimming pool, the barbecue grill, the sauna with wet bathroom, besides the garage for 4 vehicles and garden under the deck. In addition, the entire infrastructure of the hotel Portogalo is available to the condominiums (swimming pool, sauna, sports and tennis courts, helipad, restaurant and entertainment). And the best !!! The guest has at his disposal to tour the islands and beaches of the region three boats: one of 26 feet (up to 08 passengers), one of 29 feet (up to 12 passengers) and one of 38 feet (up to 16 passengers). Check out !!! Enjoy!!! Engineer, married with 3 children. I spent my childhood in Angra and always dreamed of having a beach house to enjoy pleasant moments with family and friends. All bathrooms have a shower box via heating boiler. We stayed with family and friends and had one of our best vacations ever! We travel internationally every summer with 4 children and this house was perfect for our group. It is one of our favorite destinations now! The views were spectacular and the home is beautiful with plenty of space. The owner became a lifelong friend who personally greeted us and made our stay so enjoyable and relaxing! Having a boat was a huge bonus. We were able to island hop and see things we would have missed without it. Also, the staff was exceptional! We cried when we left and hope to return to our friends soon! Thank you to Marcelo and his family! Thank you very much Staci Joe and your lovely kids. I hope to seeing you again soon. tudo show, proprietário e seus colaboradores nota 10, sempre cordiais e dispostos a fazer o melhor e agradar. voltarei com certeza mais vezes. Casa linda, muito confortável e com uma vista privilegiada. Piscina excelente e funcionária super atenciosa. Proprietário da casa pronto a atender às necessidades do hóspede . Recomendo e voltarei com certeza ! Obrigada Thaiz, foi um prazer recebê-la e espero que o retorno seja em breve. Na próxima, experimente o passeio de lancha. I must say by far the best house I have ever been to... Marcelo’s home is truly a home it has everything, truly everything you need to have an incredible vacation! We spent 5 days in January with a full day of rain and really enjoyed his home... the layout of the house is perfect for families and or couples. It’s very secluded with I crdible views.. we Bbq’d every Night and used his lancha during the day. Marcelo was an incredible host from beginning to end... he truly took great care of us and answered every time questions in seconds. The service from his staff Cátia, Carlos and Kennedy were impeccable! I can’t wait to go back!!!! Thank you! It was a pleasure hosting all of you in my home. I´m looking foward to seeing you again. Adoramos a experiência, principalmente a atenção da Catia. A casa é linda, com vista maravilhosa, piscina deliciosa e em um condomínio seguro! Adoramos a estadia...sentimos falta apenas de um pouco de manutenção na casa, como maçanetas caindo, vazamentos na chuva, piso deck empenado...mas são coisas pequenas perto da delícia que é a casa!!! A casa está perfeitamente representada pelas fotos. Bom gosto e conforto na estada. Adoramos. Obrigado Mônica e até a próxima.